Normally I'd be pretty irritated by this, but to be honest, given what an utter mess the 2018 individual market landscape is shaping up to be, I can kind of understand this; the situation is even more fluid/confusing than ever, so I guess they figured there wasn't much point in posting the rate requests earlier than necessary if they're likely to change a dozen times before being locked in anyway. In any event, today the Missouri insurance department finally posted MO's requested rate changes for next year. This is kind of a big deal for the Show Me state, because until now, they were the only state in the country which didn't allow their own insurance commissioner to review rate hike requests. 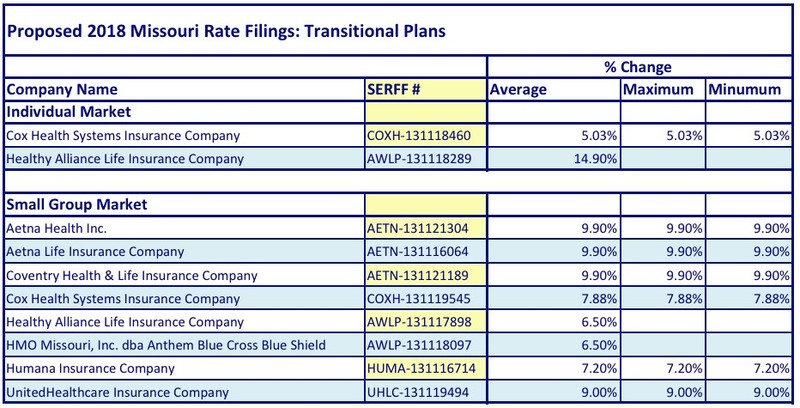 As for the ACA-compliant plans, I looked up the SERFF filings for those as well to find out the enrollment/market share numbers as well as the CSR reimbursement impact. Of the 5 carriers participating throughout the state, one is brand new (Ambetter/Celtic/Centene), and two others are operating off-exchange only (Cox Health Systems and Freedom Life), so aren't impacted by CSRs anyway. In addition, as always, "Freedom Life" is still basically a phantom carrier on the indy market, with only a single (alleged) enrollee. That leaves Cigna and "Healthy Alliance"...aka Anthem BCBS. Healthy Alliance has 116,000 enrollees on the indy market. I can't find Cigna's tally, but Missouri's total individual market should be roughly 287,000 people. If I subtract out Cox and Healthy Alliance, along with the 27,000 transitional enrollees, that leaves around 138,000 for Cigna. 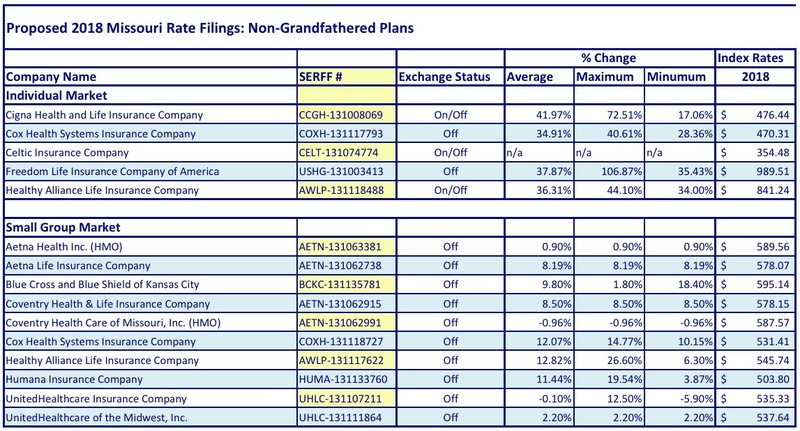 I'm sure there are also some Grandfathered plan enrollees in there as well, but this is the best I can do for now. As for the CSR reimbursement issue: Again, only 3 of the carriers would be impacted by this, and one of those (Celtic) is new to the state and therefore has no previous premium average to compare against. This leaves Cigna and Healthy Alliance...both of which explicitly state that their requests assume CSRs will NOT be paid next year. The Kaiser Family Foundation estimates that CSR non-payment will add 18% to Missouri Silver plans, which translates into around 12.2% extra if spread across all policies. Missouri carriers are asking for a 27.4% average rate increase assuming CSRs are paid, and 39.3% if they aren't.